This new edition of the Collins Chinese Gem Dictionary has been specially designed to meet the needs of learners of both Chinese and English. A clear colour layout, up-to-date coverage of everyday words and phrases, and a handy travel supplement make this dictionary the ideal por... read full description below. This new edition of the Collins Chinese Gem Dictionary has been specially designed to meet the needs of learners of both Chinese and English. A clear colour layout, up-to-date coverage of everyday words and phrases, and a handy travel supplement make this dictionary the ideal portable companion. 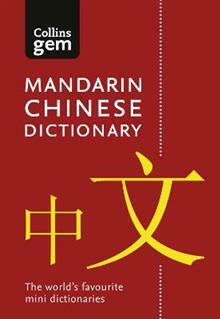 Collins Chinese Gem has been written for all those learning Chinese or English for study or for travel. It is the ideal text for anyone who needs a wealth of reliable information in a portable format. * The Collins Chinese Gem Dictionary contains all the everyday words and phrases used in today's Chinese and English that you will need to know, with a practical supplement for travellers. * This dictionary offers extra help with essential vocabulary, and thousands of useful phrases to guide you to the correct translation. * To help with the pronunciation of Chinese words, the dictionary includes pinyin for all Chinese headwords, translations, phrases and examples. Pinyin is the official phonetic system for transcribing Chinese characters into the Roman alphabet, and is accepted in all Chinese-speaking countries. * In addition, the dictionary also includes both simplified and traditional or complex Chinese characters. Simplified characters are generally used in mainland China and Singapore, while traditional characters are mainly used in Taiwan, Hong Kong and Macau. * The radical index is a clear guide to looking up Chinese characters, helping the user to navigate the dictionary and find Chinese characters without knowing their pronunciation. Other titles available in the Collins Chinese range are the Collins Pocket Chinese Dictionary, the Collins Easy Learning Mandarin Chinese Dictionary and the Collins Chinese Dictionary.